Analysis: I found this Japanese New year eve tradition to be a tradition that makes a lot of sense practically and symbolically. From the perspective of an outsider who had never practiced such a tradition, I can easily understand how cleaning houses and property to perfection before the new years starts makes sense. It is as if the Japanese people are beginning the new year on a completely blank slate. What happened in the past is the past and there is nothing they can do about it once the next year comes along. My subject, Yuki was willing to tell me about a folkloric tradition in her family. I ask Yuki if she can explain what a “Chado” performance looks like. I carefully ask if Chado is more about technique, or if the Tea is just that good. I ask what Chado has meant to Yuki. Chado, or Tea Ceremony, is a traditional art performance that has deep historical roots. It involves making tea using a highly articulate technique that requires intense training to master. People pay to watch those who know the technique perform their craft. Yuki was unable to perform the tea ceremony for me, but independent research has shown me that there are a large number of materials required to make the ceremony “work”. It has a lot to do with the concept of “authenticity” in folklore. People want to engage in a culture that is as close to its original counterpart as possible. My subject, Yuki, was telling me about the customs involved when entering a Japanese home. I ask Yuki why she thinks that Western People and Japanese People have different ways of doing things. I tell Yuki that it might be because Japanese floors are lined with tatami mats, which Japanese people sleep, eat, and generally walk upon barefoot. 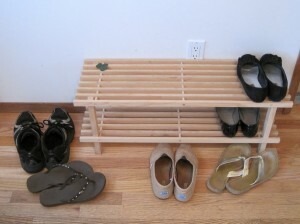 In Japan, it’s seen as customary to take your shoes off when you enter the home. This is probably because Japanese people typically walk around barefoot, as well as sit upon the floor when they eat and sometimes sleep. Japan isn’t the only culture in the world that has a custom against using shoes indoors. Countries in Europe, like Germany, Switzerland, and Scandinavia, as well as other Asian countries like Thailand and Korea, also have taboos against getting the floors dirty. I think it’s interesting that certain cultures are fine with the sanitation limits of using shoes indoors, yet others are more wary. Customs are oral traditions that are performed/enforced to maintain a cultural standard. One day two pair of woodcutters Minokichi and Mosaku go out into the mountains to gather wood, but a snowstorm prevents them from getting home. Mosaku—the father of Minokichi—suggests that they should find a cabin in the mountains to stay in to hide from the storm, and they do just that. When Minokichi wakes up the next morning though, he sees that Mosaku has been frozen to death, and a beautiful lady in white—that’s Yuki-Onna (雪女; lit. “snow woman”)—is standing over him. She finds Mosaku very handsome so she does not kill him and lets him go, but she says, “You must promise you will never tell anyone about me, or else I must kill you,” and then she disappears. Mosaku’s wife becomes angry, exclaiming, “That Yuki-Onna was me!” She wants to kill Mosaku but she didn’t want to hurt her children too, so she spared his life once again, and disappears. Informant had studied abroad in Japan and considers herself more Japanese than Chinese or American. She learned such folklore from her Japanese friends. The story of Yuki-Onna seems to have been adapted into a number of fictional materials, possibly because of the motif of the evil but beautiful white-clad woman that kills men, but also possibly because of the plot twist.